Viewing topic "Controlling set list from one keyboard"
I have a mox 8 and a motif 6(classic) that I play at jams. For an upcoming gig, I’d like to be able to control the songs via midi cable on both keyboards from my mox8. In other words, if I hit PERFORMANCE A on the mox8, is there way for it to call up PEFORMANCE A on the Motif 6 so I don’t have to hunt on the motif 6 manually for that performance. Is “Perfomance A” on the Motif in the same relative User bank location as it is in the MOX? Or is there no relationship between the two? Initially they were the same. I’ve since somehow lost the corresponding performances so I put some of them back in more or less random, non-corresponding order. I don’t know if that answers the question clearly. In a way, I’ve kind of done both. Is there one way to be recommended over the other? Selecting a Performance on the MOX causes it to send Bank Select MSB/LSB and Program Change messages. Based on the information in the Motif Classic and MOX Data Lists, those messages from a MOX set to Performance USER 1 bank are the same as the Performance mode ones for the Motif Classic. Therefore, if you set up your Performances in the MOX in USER 1, and have the matching Performances in the Motif’s Performance bank in the same locations, selecting a Performance on the MOX should select the correct one on the Motif. 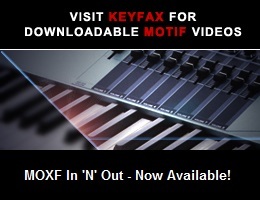 All that should then be required is a cable from the MOX MIDI-Out to the Motif’s MIDI-In. For now, you could verify this even without matching the Performance locations. Just make the MIDI cable connection, put the MOX in Performance mode, USER 1, and put the Motif in Performance mode. Select a Performance on the MOX. The Motif should change to the same Performance number. Once you determine that works, reorder the Performances as needed. That approach doesn’t require any additional hardware or apps. No problem - glad to help. Enjoy your gig.